Skilled Premises Liability Attorneys Serving Washington, D.C. Premises liability places responsibility on a property owner or lessor for certain injuries suffered by others on the owner’s property. So-called slip-and-fall accidents are premises liability cases, but such cases can include any kind of accident in or on the owner’s home, property, or place of business where there is a failure to act with ordinary care to ensure the safety of those on the property. 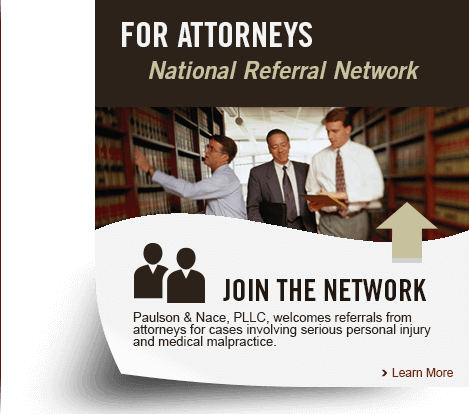 If you or a loved one has suffered injury while on property owned by someone else, Paulson & Nace, PLLC, may be able to help you recover medical costs, past and future lost income and other relevant losses. Our experienced trial attorneys have protected slip-and-fall victims throughout Washington, D.C. for more than 40 years. We are aggressive advocates for our clients, fighting to obtain the compensation they need in order to begin their path to recovery. Slip-and-fall cases. Slips, trips and falls are among the most common – and most serious – premises liability cases. Falling on an icy patch of sidewalk, slipping on water on the floor of a retail store or tripping over a broken piece of roadway may cause fractured bones, traumatic brain injuries or spinal injuries. Animal attacks. Dog bites result in thousands of emergency room cases every year. We understand the laws governing pets and animal attacks in both Washington, D.C. and have the skills and resources you want on your side if you are attacked by an animal on public or private property. Negligent security. Public property owners and operators are required to keep their buildings safe. If you were the victim of an attack on property with inadequate lighting or security measures, we want to hear your story. Injuries at school. School authorities are responsible for providing proper supervision in the classroom, hallways and at recess. Defective playground equipment, inattentive supervision and classrooms with cluttered walkways between aisles all pose a danger to your child. Elevator and escalator accidents. Elevator and escalator accidents often occur because of broken or defective equipment. At Paulson & Nace, we help people who have sustained an injury while in an elevator or on an escalator. Falling objects. Overstocked shelves in retail stores and unsecured tools or equipment on construction sites can cause serious brain trauma. In some cases, a falling object could potentially cause a fatal accident. We protect your family when your loved one was seriously injured because of falling debris. Chemicals, toxins and mold. Asbestos, mold and coal dust can cause serious and potentially fatal health conditions, such as mesothelioma and “black lung.” We help protect workers in Washington, D.C. whose jobs exposed them to toxins. We know that your family member’s health and recovery are of the utmost importance to you. Our family law firm is unafraid to try even the most complex premises liability cases in court, if we believe that it is best for your family and your future. Paulson & Nace, PLLC, proudly serves accident victims in Washington, D.C.. Our experienced team of trial attorneys may be able to help you with your premises liability claim. To find out more, please call 202-930-0292 or fill out our contact form to make an appointment at our office.